The design bug hit me again. Hard. And once again, the inspiration came from a piece that was already in my closet. It is a cardigan I already love, but wish was just a bit warmer. Why mess with a good shape, right? 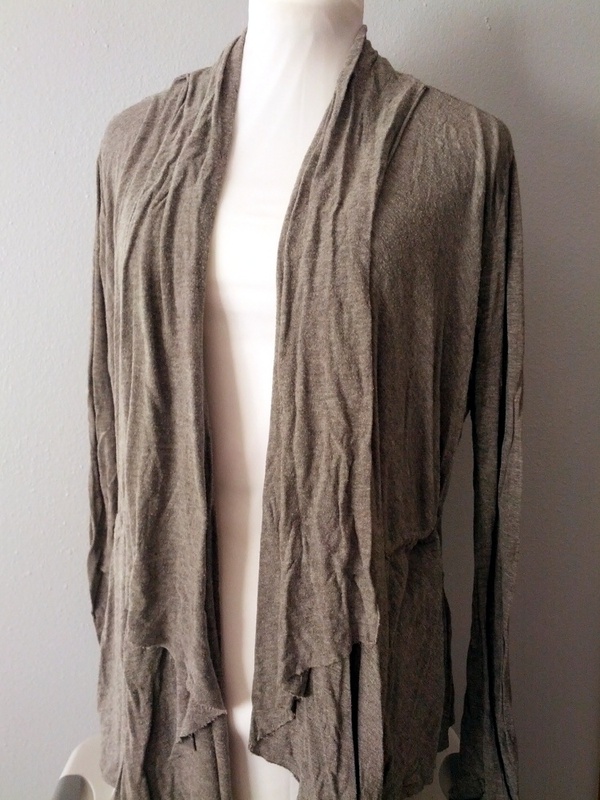 This is the inspiration piece – a t-shirt cardigan with a drape front, loosely fitted, and generously sized. It is the perfect light layer for the transitional months and in places where the A/C is just a tad on the frosty side. Equally at home with slouchy jeans or a fitted dress. But not exactly heavy enough for late fall, winter, or early spring wear. I took some measurements of the cardigan, and compared them to my actual body measurements. There are a couple of points on the existing cardigan that I wanted to adjust, so I made note of those and worked them into the dimensions for the knitted version. Then I went shopping for a yarn to match the project. You guessed it, it’s in a neutral color. All the better to hang out in my wardrobe the longest, my dears. 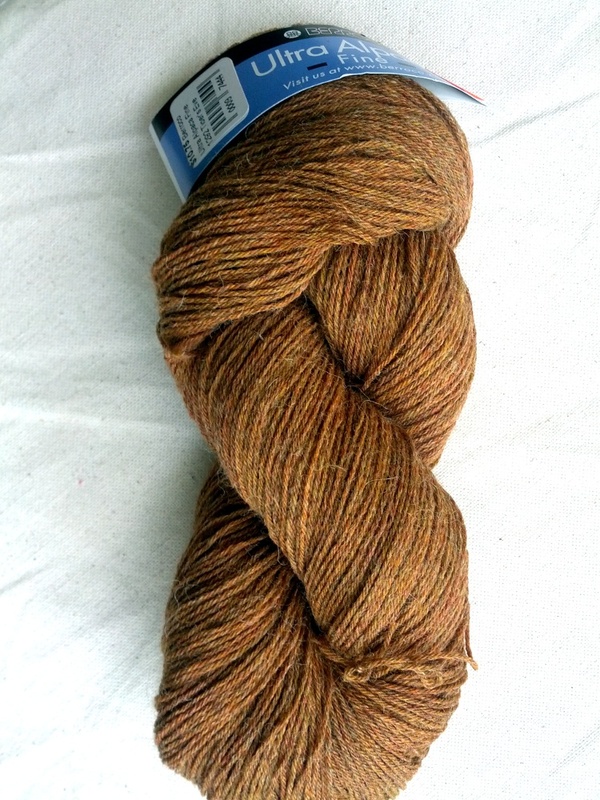 I gave the swatch a nice scrubbing – the yarn contains alpaca, which sometimes tends to bloom and stretch with washing and blocking. 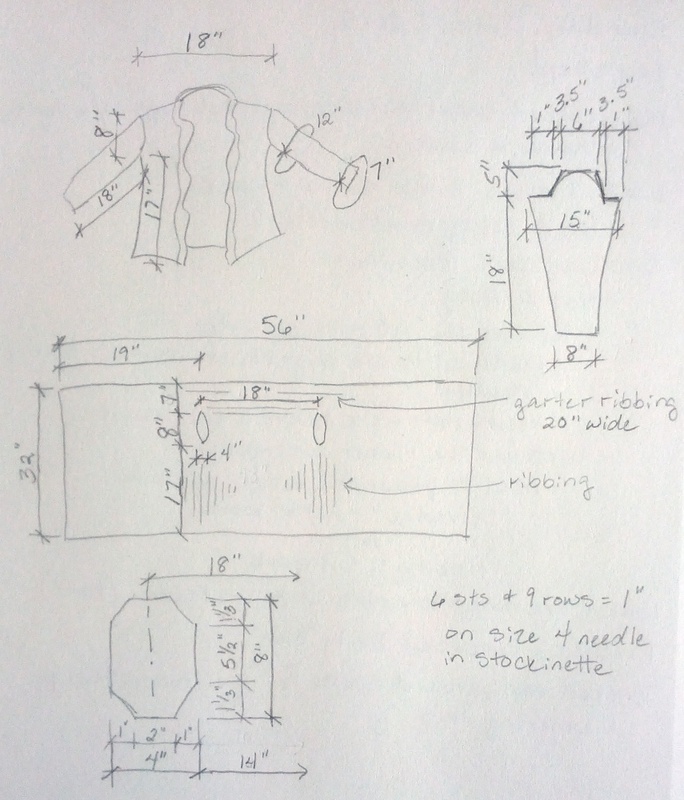 I’m also expecting this garment is going to get a lot of heavy wear, so the swatch helped identify if the fabric would be susceptible to pilling (it rattled around in my bag for several weeks, rubbing against all the other things stuffed in there). The fabric scored high on all fronts; it is soft and drapes well, hard washing and wearing, and doesn’t stretch out of shape. After taking a few critical measurements of the swatch, I created a spreadsheet for the pattern and plugged all of my numbers in. 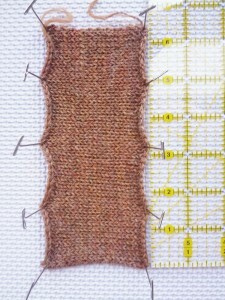 I’m discovering that I like to work out the pattern details first, then knit the sample from the pattern. This lets me just knit happily along without thinking too hard, while still making adjustments as needed. My pattern spreadsheet is a work in progress until I get finished with the sample – an adjustment in one spot filters down to all the related parts, so that I don’t have to remember all the places to update. When I’m finished it will be easy to take the spreadsheet instructions and flesh them out into a nicely formatted pattern. The first adjustment I made in the design is for the collar. 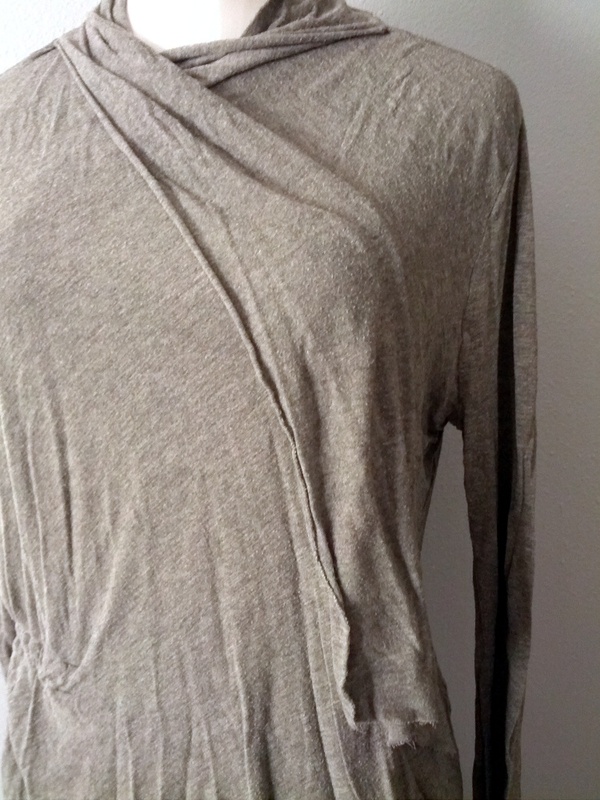 The original version has a fold-over drape front collar. I didn’t want quite that much knitted fabric bunched up around my neck in this case (says the girl who loves thick turtleneck sweaters). So I added some ribbing to gather the fabric without sacrificing the front drapes. The second adjustment is at the waist. The original version is cut straight, using a string inside a tube along the back waist to draw the fabric in (if desired) and give the garment some shape. 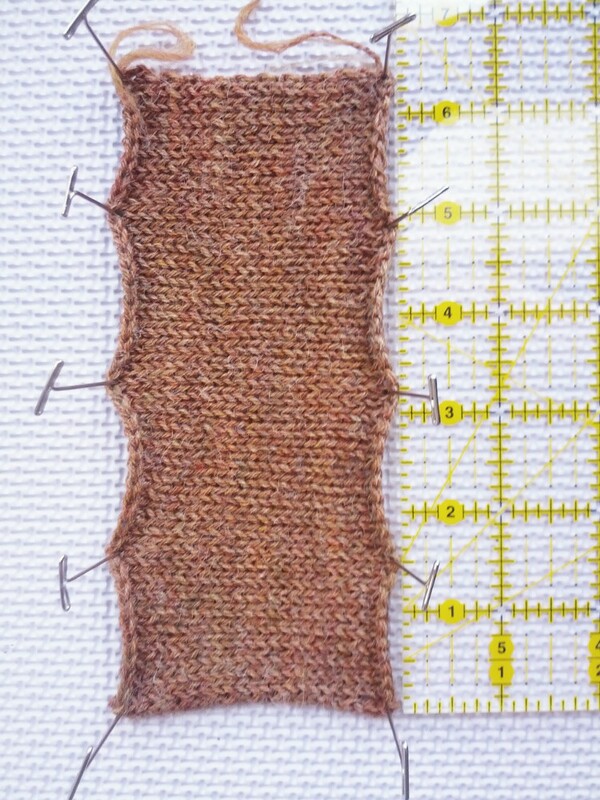 I added ribbing at the side “seams” to create this effect in the knitted version. 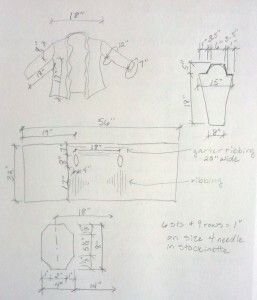 The result will be a top down, seamless sweater with moderate shaping and set-in sleeves. It will be more generously sized for wearing over a t-shirt or blouse, but not oversized or slouchy. 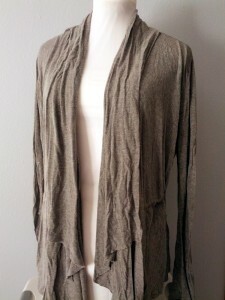 The front can be worn open, in a wrapped configuration, or tucked up at the shoulders to form a cowl-neck. With the planning stage complete, I was excited to ride the enthusiasm toward a finished project. Next step: cast on and get knitting! This entry was posted in Knitting and tagged alpaca, creativity, design, fall, knitting, sketching, spring, sweater, winter, wool. Bookmark the permalink.